A little late with this report, but I felt it was worth the effort. Am I still a dedicated Batman fan? Not really. Batman is still my favorite comic book superhero, and many of his qualities intrigue me. The fanatical interest has waned significantly since my youth. Even so, there is enough child in me to enjoy the latest Batman movie. Seeing movies in the theater on opening night is no longer a priority. My best friends frequent the theaters, often going to midnight showings of their most anticipated movies. I still enjoy some aspects of opening night, but skyrocketing ticket prices keep me from frequenting the theater. Batman Begins seemed like an appropriate movie to make exception for, and I joined my friends at the theater. I tend not to be overcritical about movies. A decent story is nice, but I'm also impressed by visual effects. Some diehard fans pick apart movie depictions of their favorite heroes, but I'm not that dedicated. Batman is a large cloud of fictional possibilities. Surely there are contradictions within comic books too, so the idea of "what's canon" is not entirely relevant. The idea that fiction can be made perfect is ridiculous. Batman is a great story and a great character. Only the work of Joel Schumacher is so horrific that they were unacceptable on every level. Most fans would agree that Batman Forever and Batman & Robin were terrible. Batman Begins was a giant leap in the right direction for me. The lengthy origin and history build up was satisfying. It is important to show Bruce Wayne's passion and the steps he went through to obtain nearly superhuman skills. I am a big fan of martial arts and was particularly pleased that some attention was given to his early training and study abroad. I do still remember some names and facts from the comics and was pleased some were included in the movie. 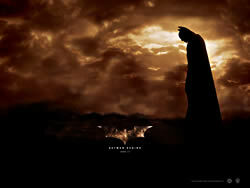 Batman Begins was a brilliant visual display and very much worth the watch.